The New England Patriots jumped out to a big lead, lost the lead, and then ultimately won the game on a last-second field goal in the team’s preseason Week 3 game Friday against the Detroit Lions. All that was overshadowed, however, by the knee injury suffered by Patriots WR Julian Edelman, who reportedly suffered an ACL tear, though an MRI will reveal the true extent of his injury. The Patriots jumped out to a 24-0 lead in the first quarter on the backs of a pair of touchdown catches by WR Chris Hogan and a run and two-point conversion by RB Mike Gillislee, but needed back-to-back field goals from Stephen Gostkowski in the fourth quarter to overcome the Lions’ comeback. With that. we give you our PFF exclusive takeaways from the contest for each team. Hogan had four receptions on five targets for 70 yards and 2 touchdowns, doing damage both in the short game and on the deep ball as he went for 32 yards for his second score. Perhaps even more important with WR Julian Edelman going down due to injury, Hogan was a key target for Tom Brady and we may see an expanded role this season. Hogan averaged a gaudy 5.83 yards per route run on the night. Brady was sharp early on, completing all 10 of his passes up to 10 yards and going 2-for-4 on deep (20-plus yard) throws for 63 yards. His best throw of the night went to Hogan on the 32-yard touchdown as he hit him in-stride with the “go” route though his worst throw also came down the left sideline as he forced a pass into double coverage on a miscommunication that led to an interception. Brady likely wrapped up his preseason with a solid outing. The Patriots decided that they needed some defensive help this offseason, so they went out and signed free agent Gilmore to a big contract to be their newest lockdown corner. Gilmore came out with some strong play in last week’s game, and that continued again against the Lions. Gilmore was on the field for nine coverage snaps and was targeted twice, allowing just one catch for a mere two yards, good for just 0.22 yards per coverage snap allowed. The other target saw saw Gilmore make a beautiful pass defense on a go route to prevent the completion. With rookie edge rusher Derek Rivers going down with an injury, the Patriots are looking for players to help replace what he would have brought to the table at the edge position. 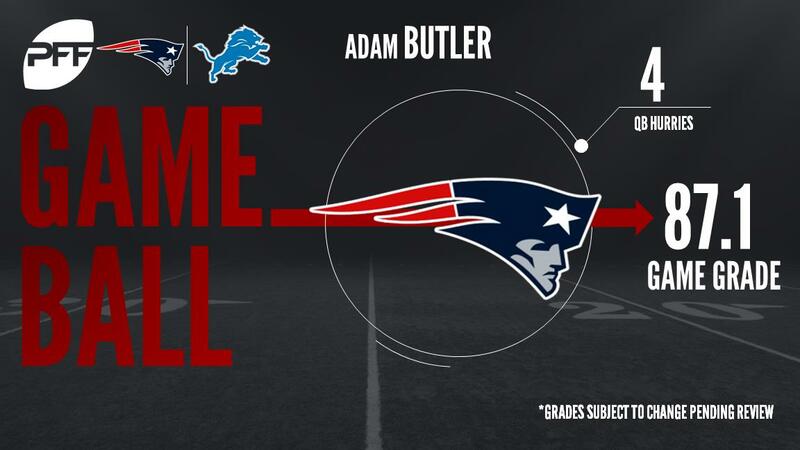 Arguably nobody on the Patriots is making a better case than Butler. After an impressive showing last week, Butler came out huge again in this one, racking up four quarterback hurries on just 17 pass-rushing snaps (17.6 pass-rushing productivity score). He also added two solo run stops on just six run snaps, en route to an impressive 85.0 run-defense grade. Stafford started out a bit slowly, as did the entire Lions offense in this preseason tilt. But he became more comfortable as the game went on, and finished with an impressive 72.7 percent adjusted completion percentage. Stafford was effective looking deep, as he completed 3-of-6 deep throws (20-plus yards downfield) for 78 yards and a touchdown. While Stafford showed strong play among the starters for the Lions, Rudock likely cemented his status as the No. 2 quarterback for the Lions with his performance in this game. Rudock completed almost 77 percent of his passes, and was constantly pushing the ball downfield. On passes more than 10 yards downfield, Rudock went 6-of-7 for 90 yards and a touchdown. Of his 113 passing yards, over 84 percent of them came in the air, as he showed he didn’t need to rely on his receivers getting yards after the catch to help him out. Barrett continued his strong preseason with a hurry as a pass-rusher and a stop in the run game. Perhaps his best work didn’t show up on the stat sheet as he was disruptive as a run defender. An undrafted free agent, Barrett could work into the defensive line rotation with continued strong play, with next week’s game a vital one for his development.